Durham, N.C. — June 26, 2013 — Parata Systems, a leader in pharmacy automation and medication management solutions, will unveil pharmacy business growth tools and technology advances at this year’s McKesson ideaShare, June 26-30, in Las Vegas. During the pharmacy industry trade show, Parata will launch a Business Growth Toolkit, demonstrate new features of its PASS Ware™ 2.0 software platform and preview a new Hours-of-Administration interface application. Attendees can visit Parata in booth 1171 for live demonstrations. A robust multimedia Adherence Library teeming with best practices, customer testimonials, tips and industry advice. Comprehensive, personalized business assessment and marketing resources that enable pharmacists to drive awareness of their adherence packaging capabilities and benefits. In addition to learning more about the Business Growth Toolkit, ideaShare attendees who visit Parata’s booth will experience PASS Ware 2.0, the company’s enhanced software platform that drives Parata PASS. Now fully integrated across the Parata PASS solution suite, PASS Ware 2.0 enables a seamless user experience and increased productivity for pharmacies offering Parata PASS strip packaging. Enhancements include a drag-and-drop feature, broad customization of PASS Pack™ labeling, a cleaner workflow and extensive reporting capabilities. 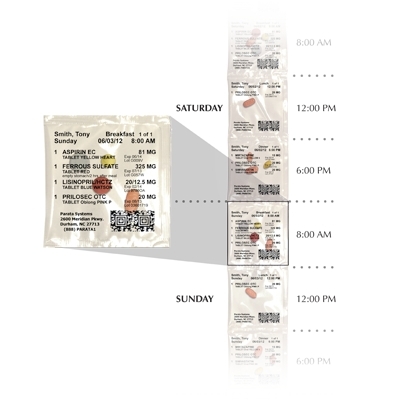 Pharmacies use Parata PASS to organize medications into a strip of unit- or multi-dose pouches the way people take them: by date and time of day. Parata PASS adherence packaging makes it easier for patients to know when to take their next dose, and enables caregivers to easily manage multiple medications, ensuring patients take their medications as prescribed with a goal of staying healthy and avoiding hospital readmissions. In its continued effort to support improved medication adherence, Parata will also preview its new Hour of Administration software application interface, scheduled for release later this year. The interface will allow pharmacists to expand their adherence solution offerings. “These new tools provide a competitive edge for pharmacists as they grow and evolve in the changing healthcare delivery system,” said Rhoads. For a one-on-one demonstration of these and other Parata solutions, visit booth 1171 at McKesson ideaShare or call 888-PARATA1. Parata is a trusted brand, providing intuitive pharmacy automation technology that enables pharmacists to improve accuracy, productivity, medication adherence, and patient health outcomes. Parata PASS™ organizes medications by date, time and dose in strip packaging that makes it easy for patients, caregivers and nurses to ensure they are taken at the right time, every time. Parata Max® and Parata Mini® ensure fast, accurate dispensing in vials. Pharmacy 2000™ workflow software extends accuracy across a pharmacy’s entire prescription volume. Founded in 2001, Parata is based in Durham, N.C. To learn more, visit parata.com, info@parata.com, 888-PARATA1 (727-2821), Facebook or Twitter.